The foyer of The National Museum of Australia. This week I have been lucky enough to have two visits to the Not Just Ned exhibition in the National Museum of Australia, one on my own and one with Shamrock in the Bush. 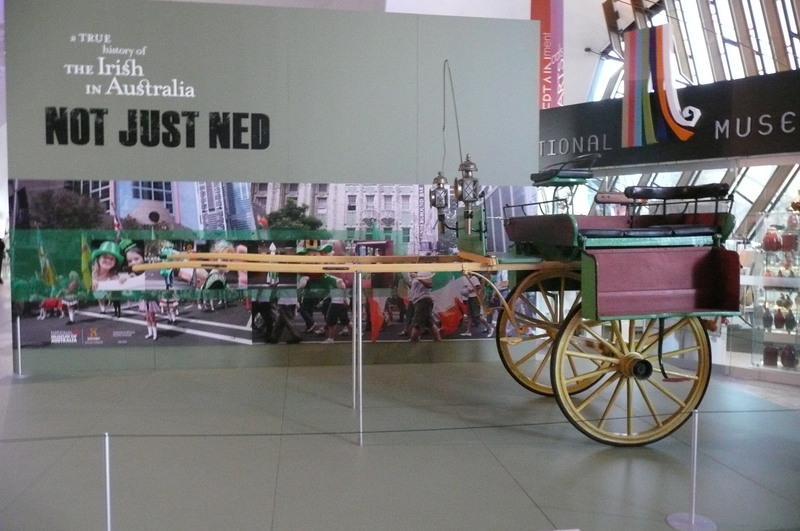 The supplementary title of the exhibition is A true story of the Irish in Australia and it is a reasonable claim: a wide diversity of objects and images are included which represent much about Irish life and culture in Australia as well as the influence of the Irish on Australia’s development and culture across all the states and territories. The sea chest belonging to orphan girl Mary Hurley who arrived on the Thomas Arbuthnot from Gort Workhouse in Galway in 1849. The chest plate given to the Yandruwandha people “for the humanity shown to the explorers Burke, Wills and King in 1861”. Lost in the desert (rather like the explorers), this wonderful cross-cultural item was only found by chance as recently as 2001. Quite an amazing story! The St Vincent de Paul Poor Registers for St Patrick’s parish in The Rocks with its sad reference that owing to her destitute circumstances “3/- (was) to go Mrs Whalan so she could go to the Newington Asylum”. Or that the members could not (would not?) visit Mrs Little at 95 Gloucester St “as it (the street or area?) appears to be of bad repute”. The tragedy of Australia’s only Irish-born Victoria Cross winner, Martin O’Meara, who was awarded the medal for his valour in the battle of Mouquet Farm, only to return to Australia in 1918 and spend the rest of his life in a mental asylum. Listening to extracts of letters read from the wonderful book Oceans of Consolation in the sound chairs on iPads in the story circle. This is one of my favourite books so I thought this was wonderful: technology combined with research literature to bring the immigrants’ experience to life. The amazing depth of knowledge, skill and commitment shown by the different orders of nuns who contributed to the education, health and welfare of many Australians, not only those of Irish descent or those of the Catholic faith. The South Australian “equal voting rights” petition with 11,600 signatures instituted by Mary Lee from County Monaghan. The beautiful “Currachs” art work by Kiera O’Toole. The astonishing survival of the jaunting car which escaped the Victorian bushfires. The laundry table found on Murndal station: a mundane household object but on closer inspection the underside of the boards retained the address for Pratt Winter, care of Portland Bay. It had been made from his shipping containers/packing boxes. How, oh how, did I forget the wonderful Rajah quilt done by the women on the voyage to Australia in 1841…so much more interesting and inspiring than those annoying Kellys! An example of an Hibernian sash. The mannequin with the Children of Mary cloak and veil reminded me of my teenage years when I was a member of this society and would go up to the church in full regalia. What the non-Catholics in the neighbourhood thought of our strange customs remains a mystery. It also brought back memories of Corpus Christi processions at the Brisbane Exhibition grounds when the Catholics of Brisbane would fill the oval in an overt and semi-defiant declaration of their faith. At the Corpus Christi processions there were also large contingents of men from the Hibernian Australasian Catholic Benefit Society (HACBS) wearing their sashes. My grandfather was always among them, as he had held many positions within the North Qld regional executive. 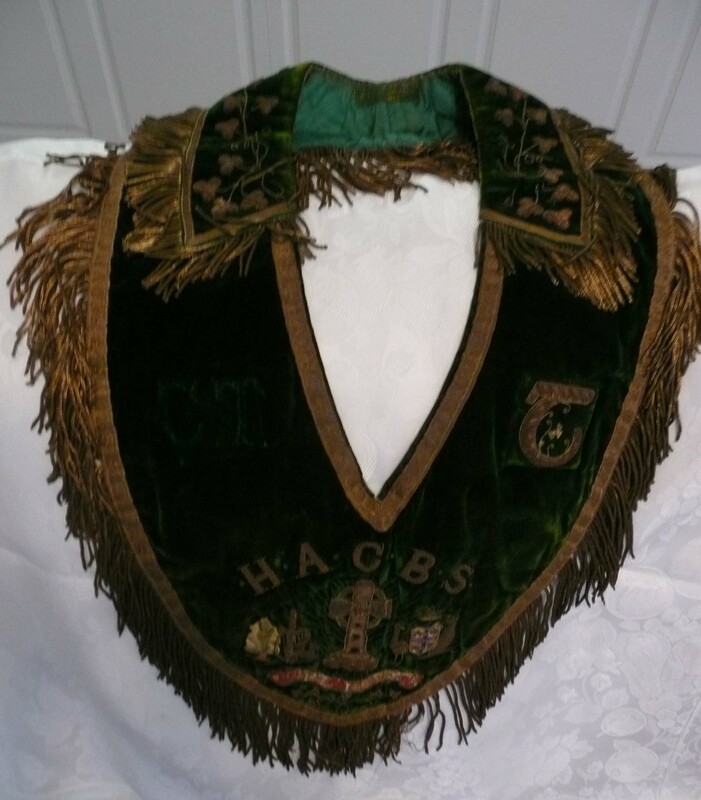 A similar sash, for the society’s National President, is presented in the exhibition alongside the leadlight doors from the Queensland Irish Association. In the same area of the exhibition is a display on Archbishop Duhig with a focus on the proposed Holy Name Cathedral in Fortitude Valley in Brisbane, an ultimately doomed plan with the site now taken over by inner city apartments. Duhig’s centenary ring is on display and my husband and I reminisced on how, after the Archbishop’s death, we both went with our respective schools to pay our respects during his public lying-in-state in the Cathedral prior to the funeral. We had to process past the open coffin and kiss his ring, a rather freaky experience I must say but perhaps not as much as for me as for my husband whose school went in the evening with all the candles flickering. The photo of the Archbishop visiting my high school in 1959 also brought back memories of his regular visits during my time there. At Shamrock in the Bush. Dr Val Noone challenged us to reflect on the exhibition, its significance to an understanding of the Irish impact on Australia and what might be included in future displays of this sort. As with regular family history research, those of us with working class Irish ancestors need to seek the traces of their history in the objects and stories but their contribution lies overtly or covertly in so many of the stories. The National Museum is to be commended for its contribution to our social history through this exhibition which has been of such great interest to so many of us. Richard Reid, senior curator, the team of other curators and conservators, and many other collaborating researchers, are to be congratulated and thanked for their assiduous work in tracking down the diverse array of objects and presenting them so effectively for our enjoyment and learning. This entry was posted in Brisbane, Irish family history and tagged All Hallows' Convent, All Hallows' School, Archbishop Duhig, Children of Mary, Corpus Christi, HACBS, Hibernian Society, Hirbernian Australasian Catholic Benefit Society, national museum of australia, Not Just Ned, Shamrock in the Bush by cassmob. Bookmark the permalink. Thanks for sharing this with us. I would love to have gone to this, but unfortunately when in Canberra this year I was with 90 16 year olds so it was out of the question. Glad you liked the story Sharon. I’m just impressed by managing 90 x 16yr olds! !